Although the adult adeniums flourished straight away in the gritty mix, transplanting the seedlings at six months was not so uneventful. In fact, they went batshit almost immediately--first turning yellow, then dropping leaf after leaf until finally, 5 of 7 seedlings had gone completely bald. Of course if I had half a brain, it would have occurred to me that watering would be critical for transplanting water-hungry seedlings. Root experiments had already been done to them when they were moved into individual pots so they were recovering from that on top of being moved into a radically more open potting material. Hardest hit were the seedlings with roots close to the surface (I planted them that way so the taproots are horizontal). So, to reduce transplant shock, soak your gritty mix in water overnight but pour the excess out before using it. This way, there will be enough moisture in it to keep the seedlings from drying out while it adjusts. You'd never do this to most succulents but adeniums behave like succulents only in case of emergency. 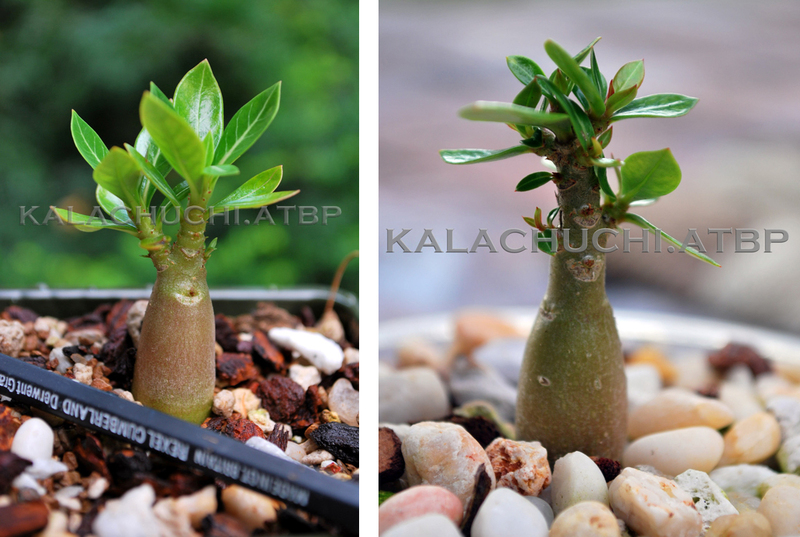 Adenium seedlings, specifically, are more like tender tropicals. They apparently don't like being dry which happened quickly because the medium is so airy. Once in gritty mix, top-dressing is necessary to prevent moisture from evaporating too fast especially in the heat of summer. During the first two weeks in this very open potting medium, watering every other day will be necessary, making sure the first top inch of the pot is thoroughly wet. The worst affected of the seedlings I repotted were the ones with roots I had carefully placed horizontally so they would develop that way. Since these roots were closer to the surface, they dried out faster. When watering frequency was increased, these seedlings recovered but very slowly. I got tired of this drama after a while though. After a couple of months, I just left them alone, watering and fertilizing them in the same ad hoc schedule as my adult adeniums. 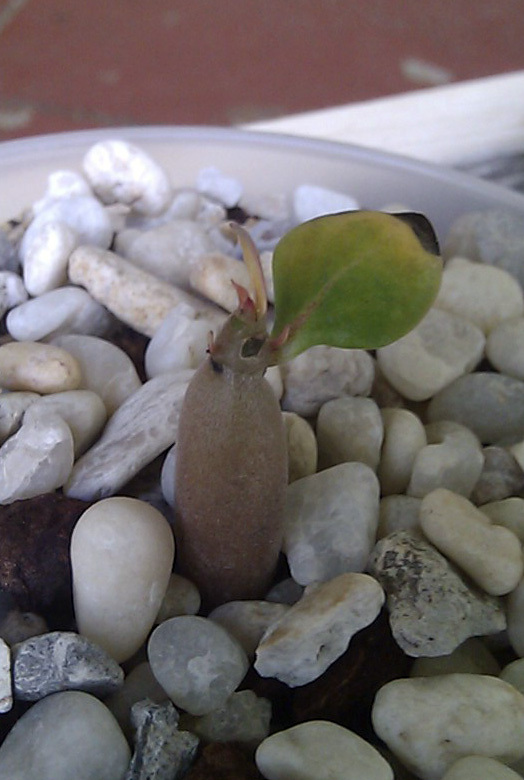 About a month later, the seedlings were again in full swing. The seedlings that initially lost their leaves tended towards more bushy growth and with consistent feeding, they recovered their color. Despite the snag, though, I still prefer growing this plant in gritty mix considering how much it simplifies watering and feeding once it is fully adjusted. Just remember you can only start neglecting them once they have adjusted to the medium. You know they have done so when you see new growth. After that, you can water and feed these seedlings on the same schedule as your adult plants.